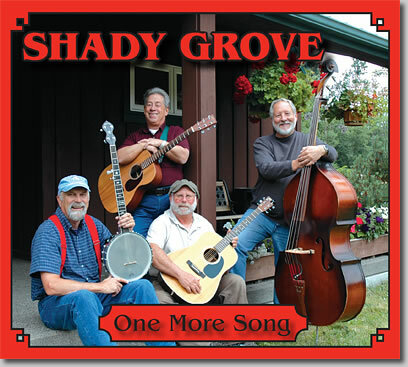 Shady Grove delights its audiences with a wide variety of fun and lively folk songs from the 1960s, including favorites of The Kingston Trio and The Brothers Four. This all-acoustic group features strong three-part vocal harmonies accompanied by guitar, banjo, mandolin and upright bass. Visit CD Baby to hear clips of the songs! go into the Angel Fund for pets. when four young kids first heard folk music. My early musical training was in violin and, in college, I purchased a mandolin. In 1974, in Indiana, I played mandolin and banjo in a folk duet, The Millrat and the Professor, and led folk sing-alongs at the Indiana Dunes. For several years, I was the lead in a barbershop quartet in Colorado. Now I'm excited to be performing 1960s' folk harmony with Shady Grove. I was raised in a family of musicians and learned to play on my grandfather's guitar. Since the age of 5, I've been singing. I've been the lead vocalist in a wide of styles, including folk, rock and gospel. In the '60s, our trio, The Cavaliers, were dubbed "folk singing teen stars" by Bay Area press. No matter where I live, or what I do for a living, I'm always singing! At the tender age of 8, I met my first love—folk music. With the help of Mel Bay's books, a guitar, and some Beach Boy records, I learned the basics of the guitar chords. With no patience to learn rock, I hung up the guitar after a lost year in college. In 2008, a chance meeting with my new neighbor, Larry Costello, reawakened all the memories of those great years of folk music. As a teenager in the '60s, I was part of the Colorado folk scene, playing guitar and harmonica. I did a very brief stint as a rock electric bass player. For the last 30 years, the acoustic double bass has been my instrument of choice. My musical tastes vary: folk, bluegrass, blues, jazz, Latin and Brazilian choro. I started out trying to play like Danny Thompson—and I'm still trying!